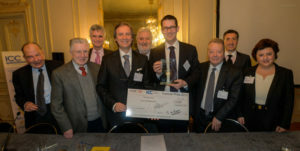 The International Chamber of Commerce (ICC) Institute of World Business Law today named Arno Gildemeister as laureate of the fourth ICC Institute Prize for his thesis Arbitration of tax disputes in international investment law (L’arbitrage des différends fiscaux en droit international des investissements). The award ceremony took place at the 33rd ICC Institute of World Business Law annual meeting in Paris. Open to anyone under the age of 40, the €10,000 ICC Institute Prize is awarded every two years for demonstrating excellent legal writing and making an outstanding new contribution in the field of international commercial law, including arbitration. The competition jury, made up of ICC Institute Council members, selected Mr Gildemeister’s thesis out of the 14 entries submitted by applicants from four continents on a wide range of issues. The directors of the chosen thesis were professors Emmanuel Gaillard and Gerald Mäsch. Describing his research as “a long and winding road”, Mr Gildemeister thanked his wife for her “unwavering support throughout the years”. It all started back in 2003 when, while studying for a masters in international commercial disputes, he was intrigued to learn that the Organisation for Economic Co-operation and Development was considering including an arbitration provision into its model tax treaty. For Mr Gildemeister, who wants to donate part of the €10,000 award to the Malala Fund for supporting girls’ education in developing countries, “the biggest prize is the expansion of one’s mind”. He encourages law students taking part in future ICC Institute contests to “follow their curiosity and investigate every question that arises, regardless of whether it has been raised by others before”. The ICC Institute Prize was launched in 2007 to encourage focused research on legal issues affecting international business, contributing to the understanding and progress of international commercial law around the world.